A tummy tuck (abdominoplasty) is performed to tighten the muscle wall of your abdominal region and remove excess skin, providing a flattened stomach. If pregnancy, obesity, or aging has left you with anything from a slight bulge in your belly to a fatty apron of skin tissue, a tummy tuck may be the ideal procedure to help restore the toned appearance you once had. Call Grossman | Capraro Plastic Surgery at 303-320-5566 to arrange a personal evaluation with our experienced Denver surgeons. In the standard/classic tummy tuck, our plastic surgeons will make an incision from hip to hip in the bikini-line area. 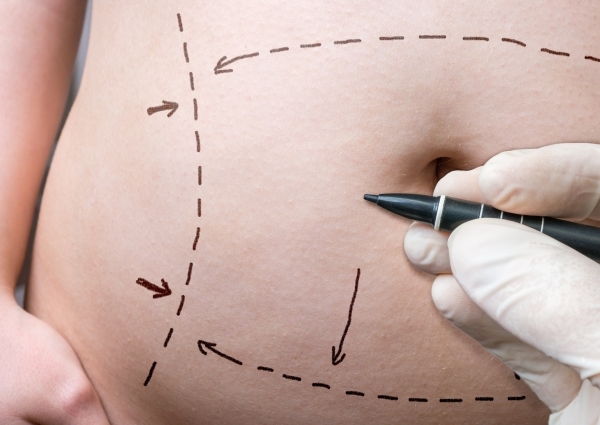 A second incision will be made around the belly button to separate it from the adjoining skin. Your skin and fat is separated from the muscles between the pubic area and the ribs. Your muscles are then tightened to reestablish their position that existed before pregnancy and weight gain. The surgeon will remove all excess skin before the incision is closed. All of the skin is removed from the belly button to the pubic region. A modified tummy tuck is generally performed when there is not enough loose skin to remove all of the skin from the belly button to the pubic region. In this procedure, the belly button is slid down about one inch to aid in the removal of excess skin. The muscles in your abdominal wall are tightened in the same ways as with a standard tummy tuck. This is the most extensive tummy tuck procedure, and it produces the longest scar. The mini-tummy tuck is the least invasive procedure of the three. It is generally performed when the desired region to be treated is contained between the belly button and pubic region. This procedure requires a smaller incision, and only the lower half of the muscle wall is tightened. Any excess skin is removed. A mini tummy tuck is an excellent body contouring option if you would like to address excess skin and loose abdominal muscles below the belly button. This procedure is the least invasive form of tummy tuck surgery, and is a great option for people with a minimal amount of excess skin to be removed and minor muscle looseness in the lower abdominal region. At your initial abdominoplasty consultation, our plastic surgeons will determine whether a mini tummy tuck will be the best option to achieve your aesthetic goals. If you do not need any additional sculpting above the belly button, this procedure is generally an ideal option. Our Denver plastic surgeons will make a small incision along the bikini line, just above the pubic region. The lower portion of your abdominal muscle wall is tightened, excess skin is removed, and the remaining skin will be lifted and stretched to achieve a more sculpted appearance in your abdominal region. In some instances, our doctors may recommend liposuction in conjunction with your mini tummy tuck for enhanced results. Your recovery will be substantially shorter and you will experience less discomfort than with a standard tummy tuck. In most cases, you should be able to return home the day of your procedure. Our surgical team will provide you with detailed after-care instructions. It is important to follow them diligently to ensure proper healing and optimal results from your mini tummy tuck. A compression garment will be worn for several weeks following your procedure to facilitate the healing process. You can generally resume light activity such as walking the night of your procedure, and you can expect to return to work within about two weeks. However, it is important to avoid strenuous activities and heavy lifting for about a month. Ideal candidates for a tummy tuck are in good general health and close to their ideal body weight. Women whose abdominal skin and muscles have been stretched by pregnancy and men and women who have loose skin following massive weight loss can greatly benefit from this procedure. If you do not meet all of these criteria, it does not necessarily rule you out as a candidate. At your initial consultation, Dr. Grossman and Dr. Capraro will review your medical history and aesthetic goals to determine whether abdominoplasty is the right procedure to deliver the results you desire. Keep in mind that the primary purpose of an abdominoplasty is to remove excess fat and skin from the stomach region and tighten abdominal muscles to create a more toned appearance. If your primary concern is removing excess belly fat, then liposuction may be a better option to achieve your goals. You should wait to have a tummy tuck until you are done having children since any future pregnancies will re-stretch your abdominal wall. Many women choose to get an abdominoplasty as part of a mommy makeover in order to restore their pre-pregnancy figure. Pregnancy can stretch your abdominal muscles, making it difficult to regain a toned, flat stomach after childbirth. Abdominoplasty can be performed to tighten these loose muscles so that you can enjoy a firmer, more sculpted stomach appearance. Dr. Grossman and Dr. Capraro also commonly recommend abdominoplasty for patients who have undergone massive weight loss. In many instances, significant weight loss will result in excessive sagging and loose, hanging skin in the abdominal region. Abdominoplasty can be performed to remove excess skin so that you can feel great about your appearance after weight loss. After your abdominoplasty procedure, you will be closely monitored before leaving our surgical center to ensure you have fully recovered from the anesthesia. You will need to have someone available to drive you home from the hospital and stay with you for a few hours in case you need assistance. Also, you should plan on getting plenty of rest during the first day of your recovery so your body can heal. You will need to drink plenty of fluids to prevent dehydration. Our plastic surgeons will apply a soft dressing which will be held in place with an abdominal binder. After one week, the binder will be replaced by a girdle. We use a biological tissue sealant and adhesive to seal the abdominal skin back to the muscles. They usually do not use drainage tubes in this surgery. You can generally resume light activity the night of your surgery. However, it is important to avoid activities that cause you to use your abdominal muscles. Walking is generally the best activity immediately following abdominoplasty surgery. It will take about six weeks for your body to develop enough scar tissue to support the abdominal wall. Therefore, you should refrain from rigorous activities during that time period. If you notice any of these symptoms, contact Dr. Grossman and Dr. Capraro at once. Dr. Grossman and Dr. Capraro will apply a soft dressing that is secured by an abdominal binder. You will need to wear the binder for one week, and then it will be replaced by girdle. You will also return to our office at this time for a follow-up visit so that Dr. Grossman and Dr. Capraro can monitor your healing. You can gradually resume normal activity over the next few weeks, and you can expect to return to work after the first two weeks of your tummy tuck recovery. However, it is important to avoid strenuous activities for about six weeks to ensure proper healing of the abdominal wall. Your results will gradually become apparent over the recovery period, but it may take as long as 6-8 weeks for the final results to be visible. At this point, you will be able to enjoy a more toned, flat stomach. By maintaining a healthy diet and exercising regularly, your results should last for a long time. Please contact Grossman | Capraro Plastic Surgery by calling 866-221-9665 or contacting our office online to find out if abdominoplasty is right for you. Our surgeons perform tummy tucks and other body contouring procedures for patients throughout the Denver area including Littleton and the nearby communities.